Ok, believe me when I say that no one is more shocked than me that Kim Kardashian is actually making an appearance on GlamAmor. After all, this is a girl best known for wearing tight trendy outfits that are most often the opposite of the ladylike classics I love. But one of the goals of GlamAmor is to show the impact of classic cinema on today's trends and here is an example of that very fact. 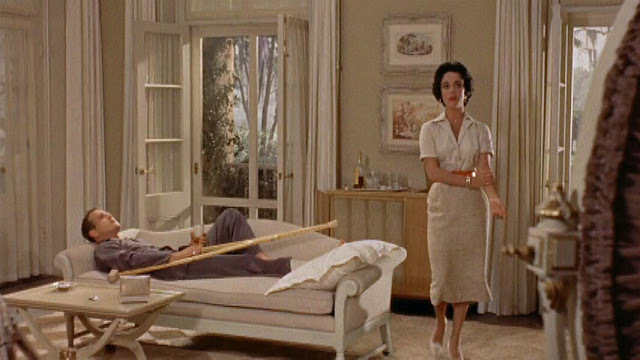 If you were ever in doubt of the ongoing influence of cinema on fashion, just take a look at Kim copying Elizabeth Taylor's Cat on a Hot Tin Roof ensemble from 1958. This is for her perfume's advertising campaign, no less, which means it's an outfit very carefully chosen for its appeal. And when I say copy, I mean copy...piece for piece from tip to toe. 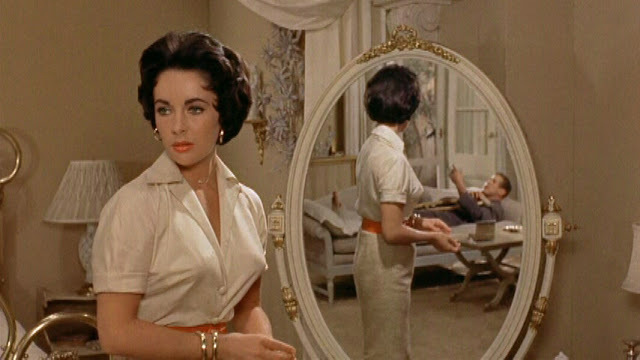 Compare her homage with photos of the original outfit on Elizabeth. It's all there--gold hoop earrings, diamond pendant necklace, white short sleeve blouse (with fabric covered buttons), orange belt, cream tweed skirt, gold bangle bracelets, and cream pumps. My jaw absolutely dropped when I saw the photo in one of my magazines and no credit given to the source of the original style. For those who don't know, this is yet another example of classic Helen Rose, the MGM costume designer whose design inspired Kate Middleton's wedding dress as well. 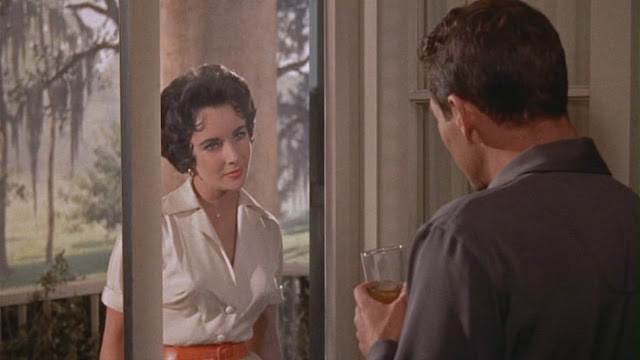 Coincidentally, I just happened to discuss both Helen and the wardrobe from Cat on a Hot Tin Roof with Turner Classic Movies on their July podcast. 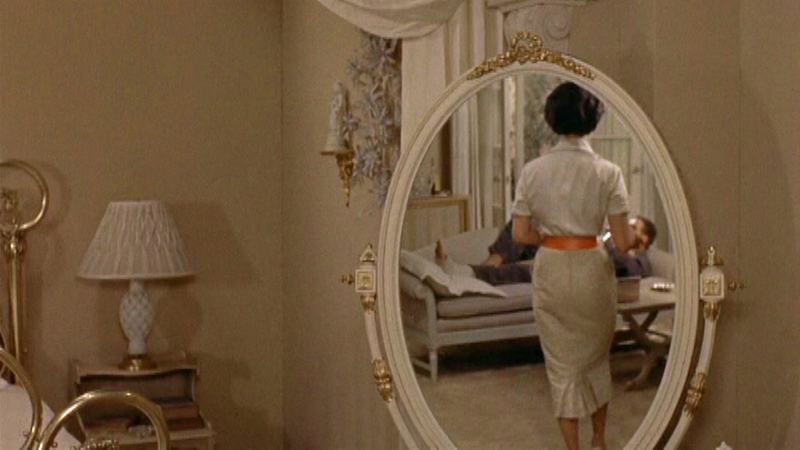 Make no mistake...the best designers and stylists know their history and use classic cinema as a reference and resource all the time. The next time something is a big hit in fashion, just remember that the best new outfits are most often old. OMG, I am truly in SHOCK! I wonder (don't you?) who her stylist is!?! Wow, Kimberly, this is incredible and proves what we vintage lovers already know...great vintage style is TRULY timeless! Thanks a million for sharing this with we who worship at the shrine of St. Helen! Great, great catch! I was absolutely shocked when I saw this! I looked over to my mother and said "Kim is trying to be Maggie the Cat!" and THEN the look was merely attributed to "old Hollywood glamour." This is design theft, especially with not citing the inspiration. OF course, they probably don't know how to cite references, anyway. It IS incredible, isn't it? I must have stared at the photo for five minutes in disbelief that a) it was a copy from top to bottom and b) that they didn't even say that it was her homage to Elizabeth Taylor in Cat on a Hot Tin Roof. lol So few people today really know their film history, so they probably just assumed 'references' were not needed. But what a missed opportunity, especially when Kim was technically the last one to interview Elizabeth before she died and cited her as an influence.